In the sentence, ‘many’ is the subject of the verb ‘believe’. That is, ‘many’ acts as a noun phrase. This would lead you to think that ‘many’ should be tagged as ‘NNS’ (for plural common noun according to the Penn Tree-Bank tag-set). For a lexicalized grammar, such as the English Resource Grammar (ERG), this might suggest that a nominal definition of ‘many’ would appear in the lexicon. Well, the ERG does not include such a definition (at least not the one this person expected). In general, a cardinality can be promoted to a noun (at least syntactically). Consider, for example, “the bread was shared among three.” In this example, there is an implicit noun which there are 3 of, but that noun does not appear in the sentence. In the sentence “three is a number”, ‘three’ is clearly a noun. Is ‘3’ a noun in ‘There were 3.”? Clearly there were 3 of something and whatever that something may be is the “head” of the noun phrase uttered as ‘3’. The ERG, being a head-driven phrase structure grammar (HPSG), “wants” this nominal head to be modified by “3” as a cardinal adjective. The preceding are the “semantic” discriminants. 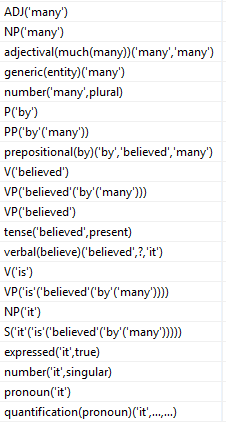 There are additional lexical and syntactic (and some other kinds of) discriminants not shown. The ‘many’ argument in the second line above indicates that the adjective many modifies the same span of text (i.e., that what it modifies is elided). It was this rendering that the user did not understand. In any case, the general heuristic during disambiguation is to chose what is easiest and most certain first. Here, the verbal in which ‘many’ is the subject of ‘believe’ and ‘it’ is its object is the most obviously correct choice. Indeed, making that choice fully disambiguates the sentence! 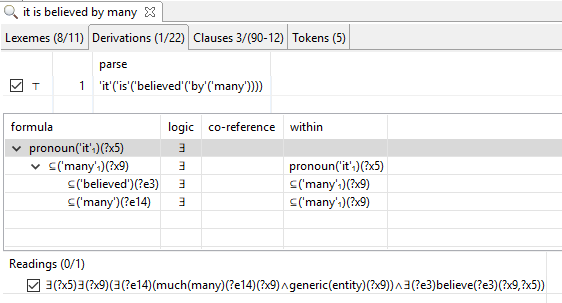 The full set of implied discriminants is shown below. Of course, the conflated logic without the Davidsonian variables is typically how Linguist users prefer to view their logic. 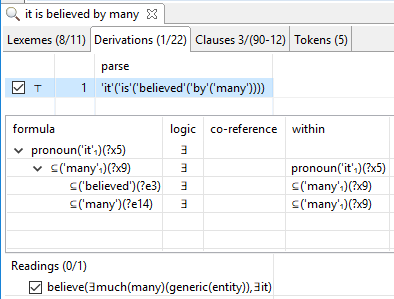 On the other hand, if the application requires temporal or causal knowledge representation or reasoning (KRR), then the Davidsonian variable on ‘believe’ (i.e., ?e3) may be critical. The astute reader may be interested in learning more about the motivation for “?e14”, in which case, I recommend Jerry Hobbs‘ classic, “Ontological Promiscuity“.